I do all my food research on Instagram so when I was looking up brunch places, I came across Cuckoo Callay. Located just outside Newtown station (literally outside), this cafe was having their 3rd annual bacon festival. This entry was posted in Eat and Travel and tagged bacon, brunch. My friends and I gathered at Stormcrow Alehouse for brunch because we wanted to play board games. They are located on Broadway and Fir St., next to Earl’s. We had passed by before and thought that we should return. It was really bumpin’ at night! This place looks cool inside and they put in a lot of effort to include fantasy themed decorations! Sadly brunch was terrible and only one item was good. This entry was posted in American/Burgers, Breakfast/Brunch, Food Reviews and tagged bacon, banana bread, Eggs Benedict, french toast, omelette. My co-workers were craving burgers so we decided to hit up Romer’s Burger Bar in Yaletown. 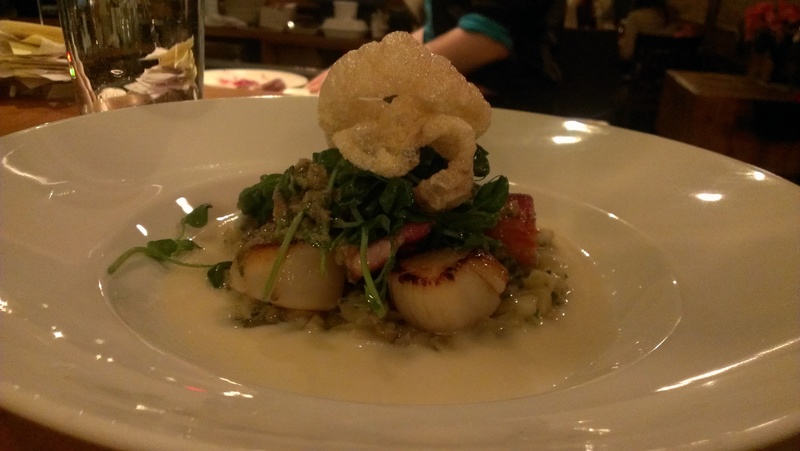 They have three locations: River District, Kitsilano and Yaletown. The burgers at Romer’s do not come with fries so you will have to add them separately to your order. The fries come in an individual size or in a shareable size. 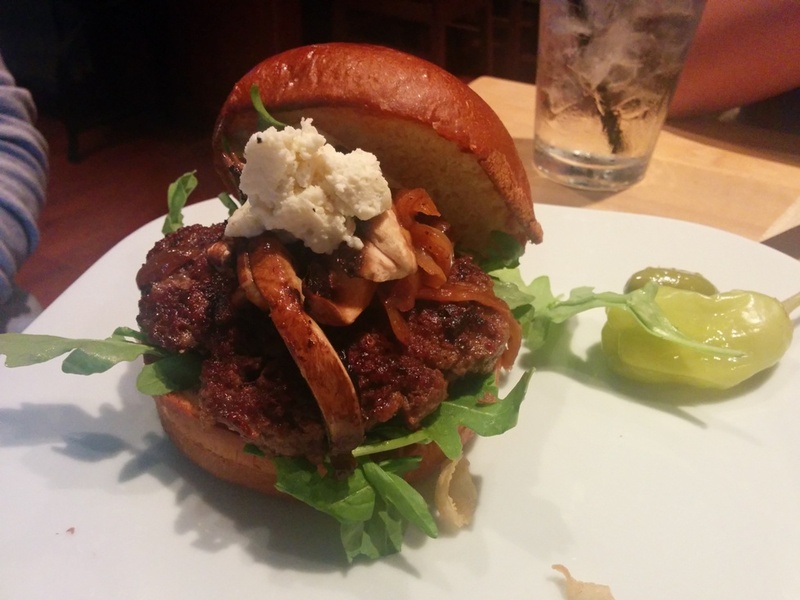 This entry was posted in American/Burgers, Food Reviews and tagged bacon, burgers, fries, short ribs, truffle oil. Strike has taken over the spot where Vera’s used to be (in the corner by the washrooms). So far no one has really been successful in this sport but hopefully Strike will be here to stay. Strike is a Taiwanese restaurant and they have a location on Garden City and one on Broadway. 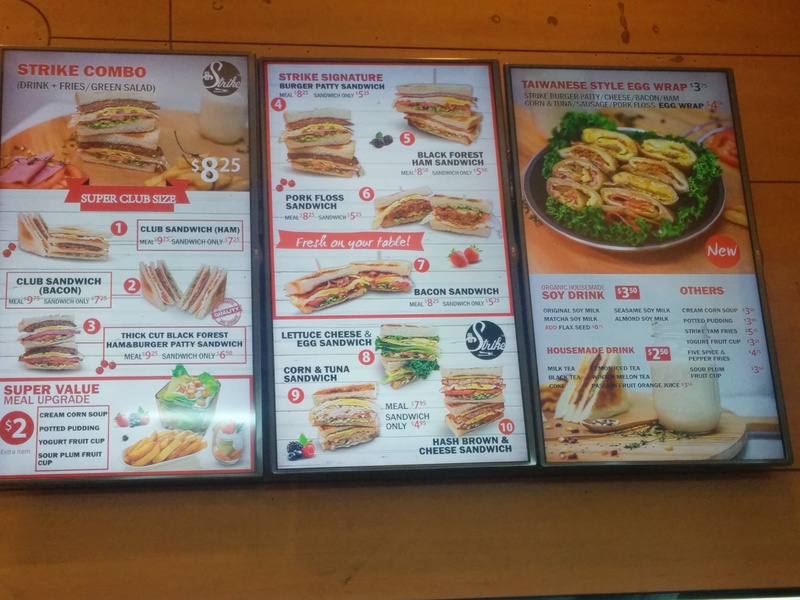 This location in particular specializes in Taiwanese sandwiches. This entry was posted in Asian, Food Reviews, Taiwanese and tagged bacon, egg, fries, lemon tea, sandwiches, soup. None of us have been to Forage so we were excited to see what they had in store for us. 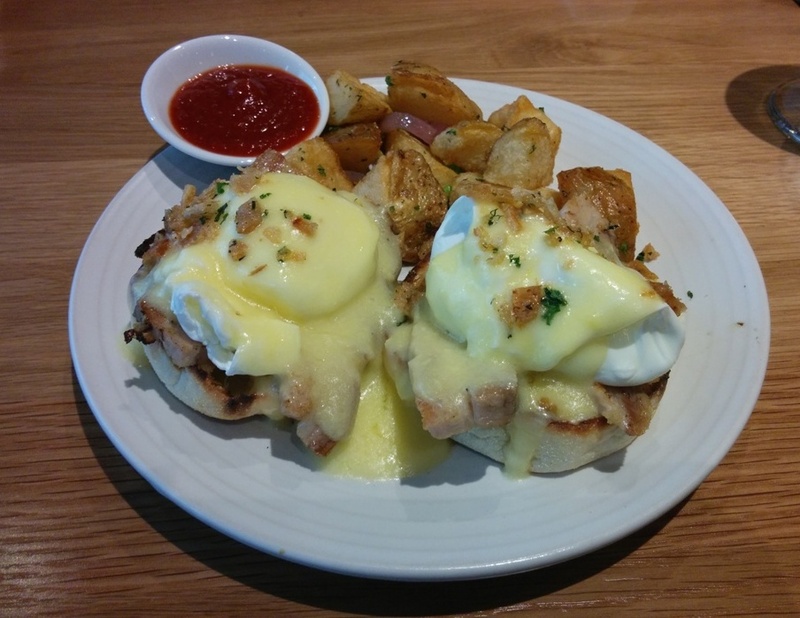 The special of the day was the Pork Belly Eggs Benedict. Crispy potatoes with an addictive house made ketchup were served side. Not sure what else was in the ketchup but it was probably some sort of spice. The pork belly was fatty but not overly so and there was a good amount of it too. My eggs were poached to a medium as per my request. I found that the hollandaise sauce was quite buttery and rich as but a tad salty as well especially when eating with the pork belly. David also said that he could taste the tarragon in this dish but since I’m not sure what that tastes like we’ll take his word for it! 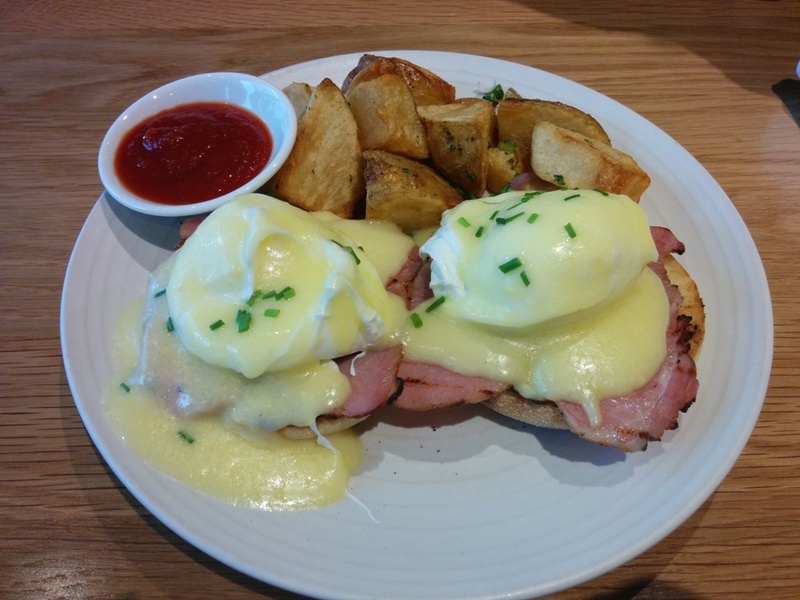 This was the Classic Benny served with back bacon and the same crispy potatoes and ketchup as above. 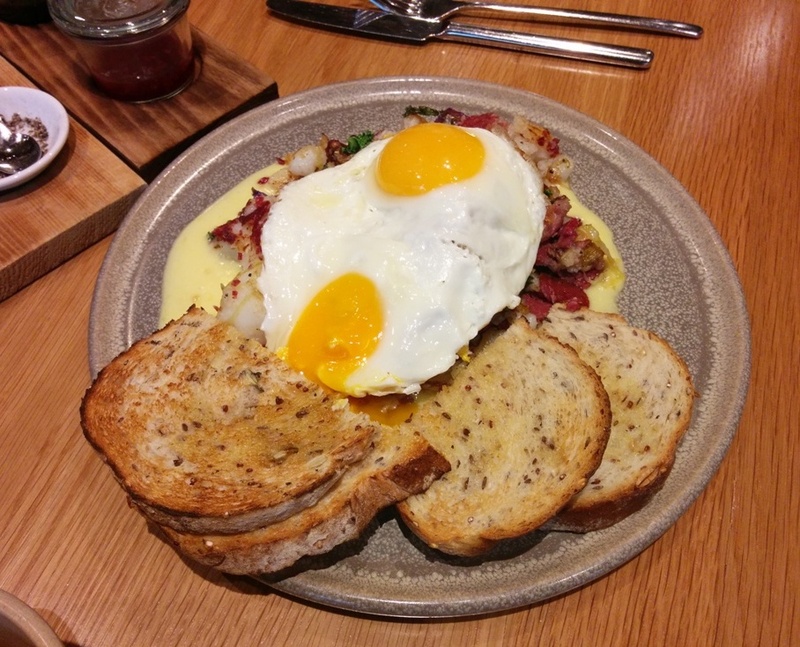 This was the Corned Bison Hash with sunny side up eggs, kale, house made sauerkraut and IPA mustard hollandaise with lots of multigrain toast on the side. This dish was bigger than the eggs benny dishes! It will definitely fill you up. I tried a bit of the bison and it was good… can’t really describe it since I haven’t had much bison before! 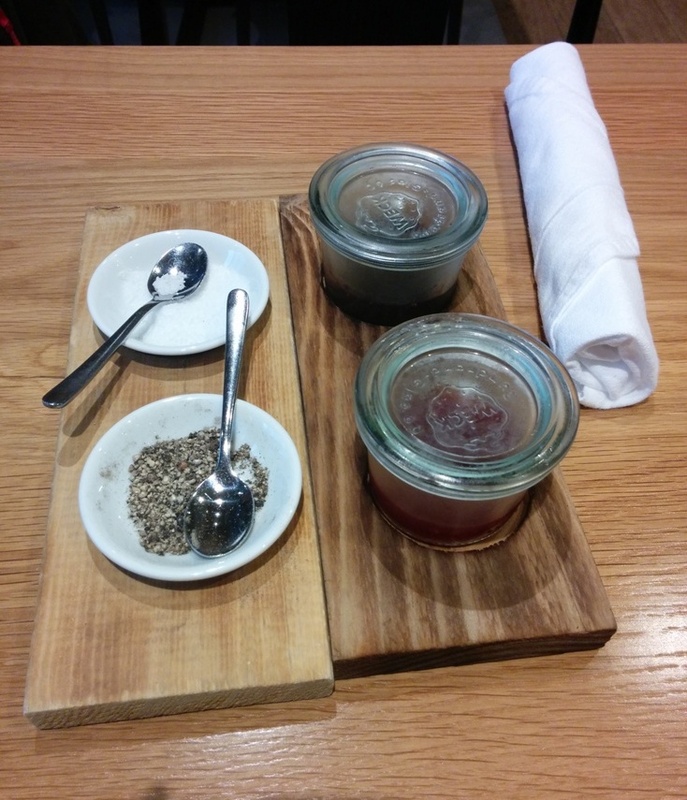 There was also house made blueberry and strawberry jam available for the toast as well and they were both fruity but not too sweet. We had an enjoyable brunch together and I was surprised that the restaurant wasn’t busier for brunch but maybe it was because it was pouring earlier. This entry was posted in Breakfast/Brunch, Food Reviews and tagged bacon, brunch, eggs, Eggs Benedict, hash, pork belly, toast. I finally made my way to Fable Kitchen!!! *happy dance* I’ve just heard so much about this place and it has tons of good reviews. We just managed to get a table at the bar since we didn’t make a reservation and by 6pm that was the only spot left. Not that I really minded since we got a good view of the cooks preparing all the food. 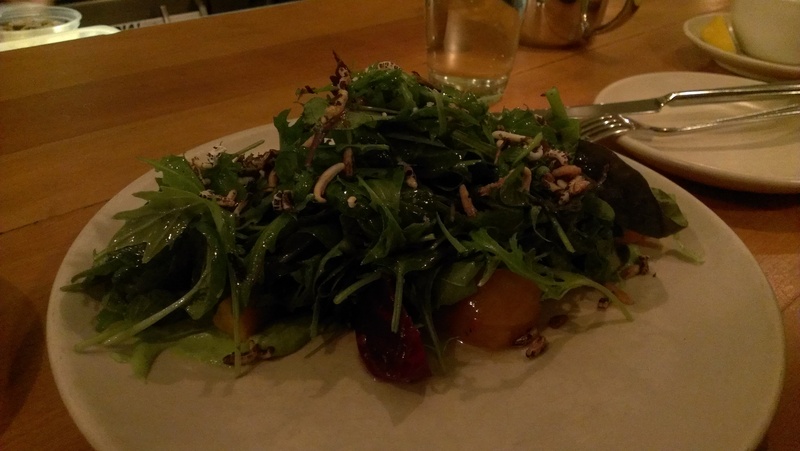 We started off with the Roast Beet Salad. I’m not a huge fan of beets and I don’t eat them often but these were pretty good. They had that texture that made them seem sort of pickled, not too soft or too crunchy so the texture was a nice addition of the greens. There were also some crunchy rice bits on top and there just was enough vinaigrette. 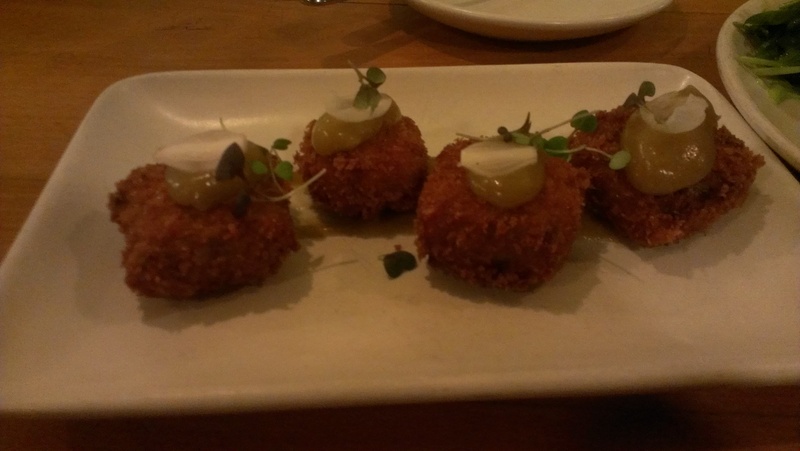 We also ordered the featured appetizer of the day which was Pork Croquettes with some apple puree. The server had described the pork as something like pulled pork and I was imagining the pulled pork in sandwiches but this was completely different. It was more like really soft minced pork almost like the kind you would see in a dumpling but it wasn’t in a uniform lump and the filling was really soft and smooth inside. 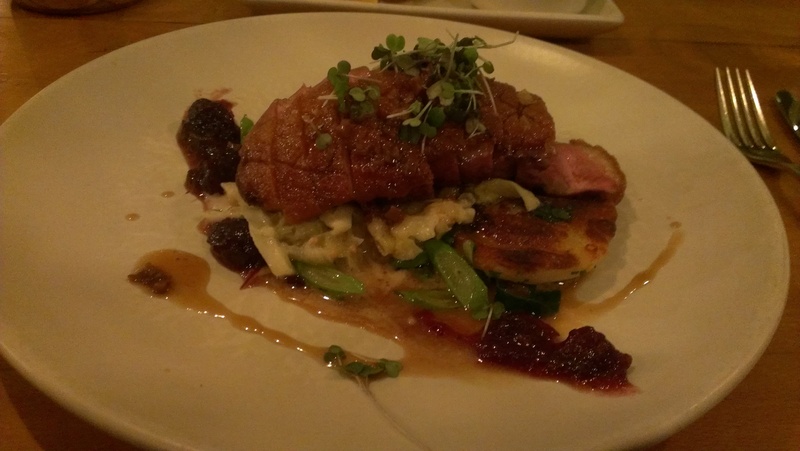 I had the Duck Breast with cranberries, sauteed cabbage and perogies. I didn’t think perogies could be paired with duck breast but it worked. This was the best duck breast ever!!! Which might not be saying much since I don’t eat duck breast all the time… but it was still the best to me! It was cooked to medium-rare and still very moist and easy to chew. It actually didn’t have too much fat and the only seasoning was from the skin. THIS WAS SO GOOD. The perogies had a really soft filling and a slightly crunchy exterior. I just love everything on this dish. On to the desserts! We got a few to share. Yay! 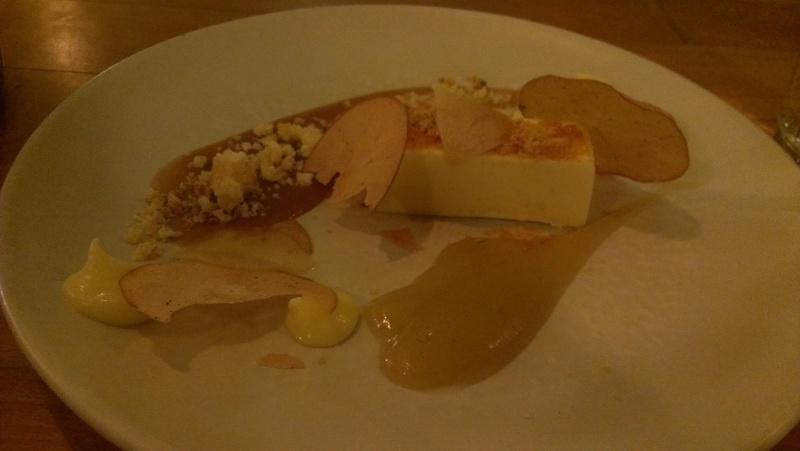 This was the Mascarpone Cheesecake with chai caramel, dried apple and almond brittle. This was a very light cheesecake and it wasn’t too sweet so it’s a good choice if you’re not big on desserts but you still want some. 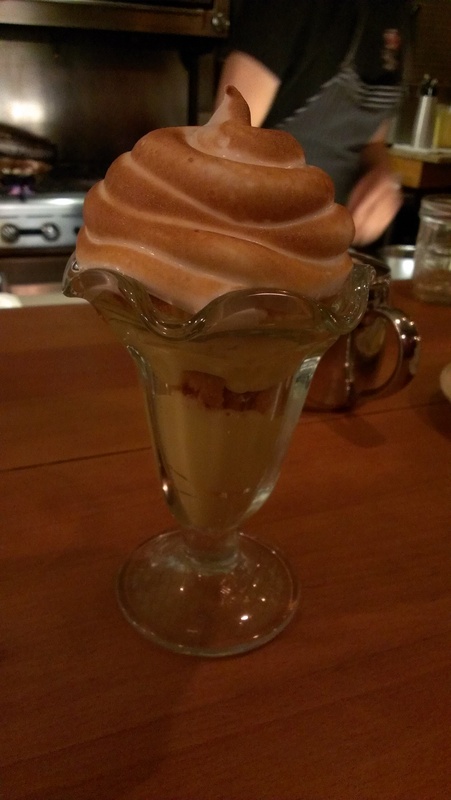 We also ordered the Lemon Meringue Parfait with tarragon ice cream and streusel. It’s a very big and impressive looking dessert! The meringue was nice and light and then there was a scoop of tarragon ice cream underneath. I’m not sure what tarragon is suppose to taste like but it was ice cream so it was enjoyable either way! The streusel at the bottom made the dessert a bit crunchy. My friend thought it was a bit too sour and wished there was more ice cream. I like lemon so it was alright for me. After everything from all the layers was mixed up it was hard to see what I was eating so I’m sorry if this isn’t too accurate! This was my favourite dessert! S’mores with brownie, peanut butter ice cream tooped with lots of marshmallow. First of all this was chocolatey and the brownie was nice and soft and then the ice cream was really good too. The half melted marshmallow layer on top sealed the deal! I just love all the layers in this and you really need to dig in to get some of everything! I didn’t find that it was too sweet either except I didn’t eat the whole thing so that might be why. I totally have to come back! :D I think getting to try 3 desserts in one night was the best part. Also the DUCK BREAST! I’m sure their other entrees are wonderful too or so I’ve heard. 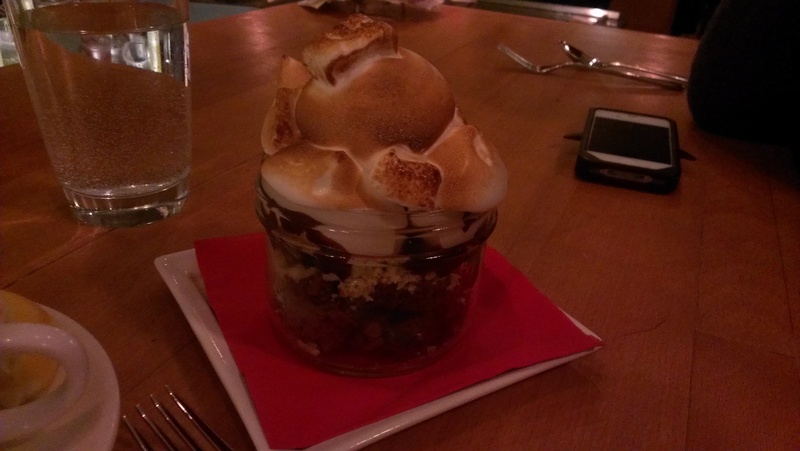 This entry was posted in Food Reviews, West Coast and tagged bacon, cheesecake, desserts, duck breast, ice cream, scallops. The General Public is the sister restaurant of the ever popular Eatery on W Broadway. I had a bit of trouble finding this at night because they have a black awning that blends in with the store next door and I didn’t see any obvious store sign. The interior was almost as funky as the Eatery but it was also newer and cleaner looking. However, it was really dark and hard to see the food so please excuse the horrible pictures. I’ve only been to the Eatery once and that was a while ago so I’m not going to compare them but like The Eatery, the menu had some interesting creations with funky names. We started off with the Bacon Striptease which was four pieces of egg and flour battered and fried bacon drizzled with maple syrup and spicy mayo. I think it looks a bit oily here but maybe that’s the maple syrup on top? The pieces of bacon looked big from all the batter but I don’t think it was actually that big. It tasted mostly like syrup and spicy mayo instead of the saltiness of bacon. We still enjoyed the crunchy and sweet combination but I wouldn’t order it again. On the left we have Sushi PIzza Bites which were deep fried rice patties topped with spicy tuna. These were not bad but it seemed a bit pricey to me and not that special. 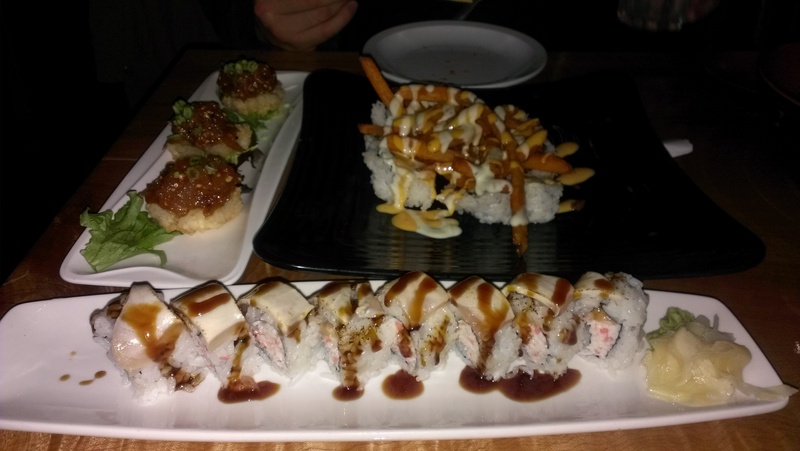 On the right we have the Japanese Fortress which had spicy tuna and cucumber rolls topped with yam fries and mayo. The yam fries were really good and there was a decent amount too! It was probably better than the roll itself. I also noticed that the rice was falling apart and it looked like it was cut in a sloppy way. Maybe they thought they could hide it under the fries. In the front we have the Tataki Attack which had avocado, crab and scallop wrapped in seared albacore tuna. I didn’t really notice that the tuna was seared but this was a pretty good roll. We also had a Pork Katsu Donburi but it was flavourless. We had to add copious amounts of soy sauce to it since the breaded pork was on the drier side and had no flavour and the rice was in large dry lumps… It could have used a lot more sauce and there was a lot of rice. It’s an interesting place to try but it’s mostly for the ambiance and not the food. 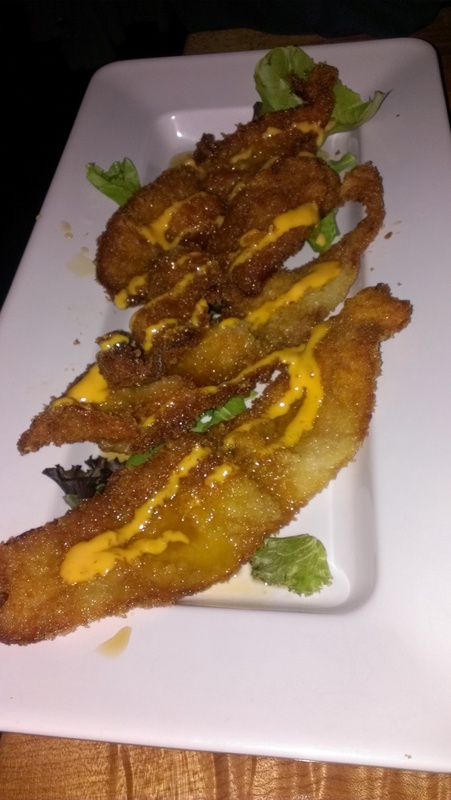 This entry was posted in Food Reviews, Japanese and tagged bacon, fusion, Japanese, sushi, yam fries. Now I’m not a huge poutine fanatic but I do enjoy eating them like everyone else who loves fries. 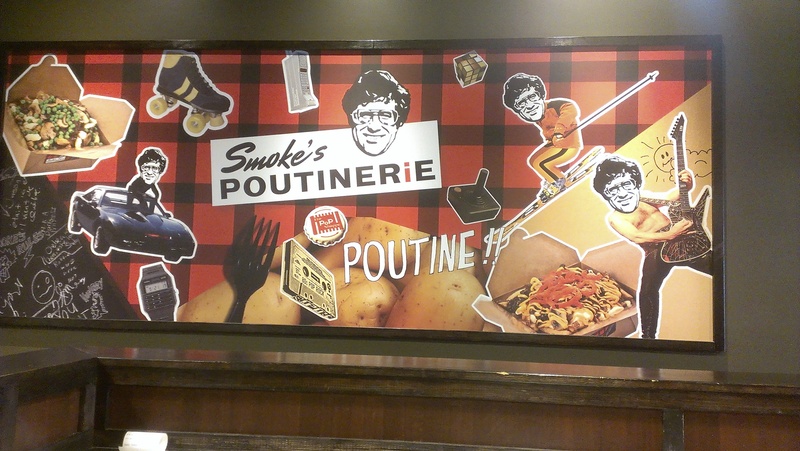 I was excited to try Smokes Poutinerie when I heard that we were getting out first location here in Vancouver. Their store is located on Granville St. next to Harvey’s and when I walked in with a friend for lunch it was empty. Maybe the location isn’t the most obvious since it’s easy to miss. All their poutines are $7.99 and they have a lot of toppings like steak and pulled pork and chicken etc. I noticed that the Pulled Pork, Double Pork and Triple Pork were all the same price! Being the pulled pork fan than I am, I decided we had to get the Triple Pork! This includes Chipotle pulled pork, double smoked bacon and Italian sausage. Do you feel your arteries clogging yet? We were NOT expecting this mountain of toppings! O.O We couldn’t even see the fries… The pulled pork had a mild sweet flavour to it and then everything else was just salty. Since there was a lot of toppings the fries underneath got a soggy and we had to get through the pile of meat before we could see the fries. There were plenty of squeaky cheese curds though! This was just one enormous portion and I don’t think I could’ve finished it by myself. At least it looks like you get your bang for your buck. 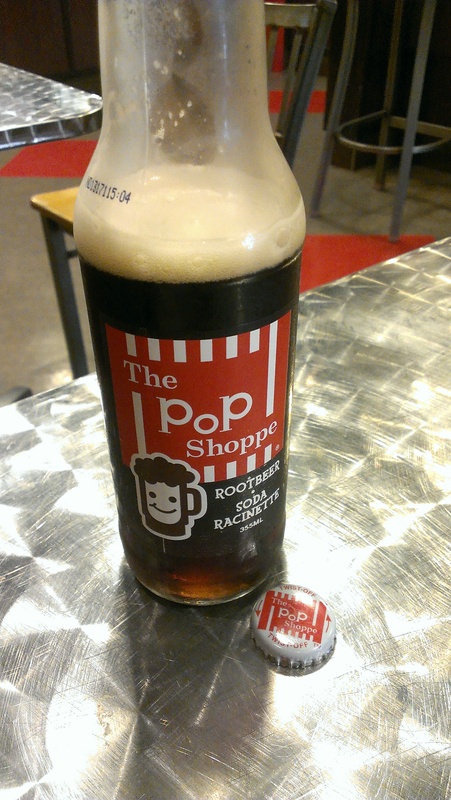 Thankfully we also got a Pop Shoppe rootbeer to wash away the saltiness! I liked that they had a variety of toppings but I also didn’t like the soggy fries. It would probably still be satisfying if you had a massive craving though. 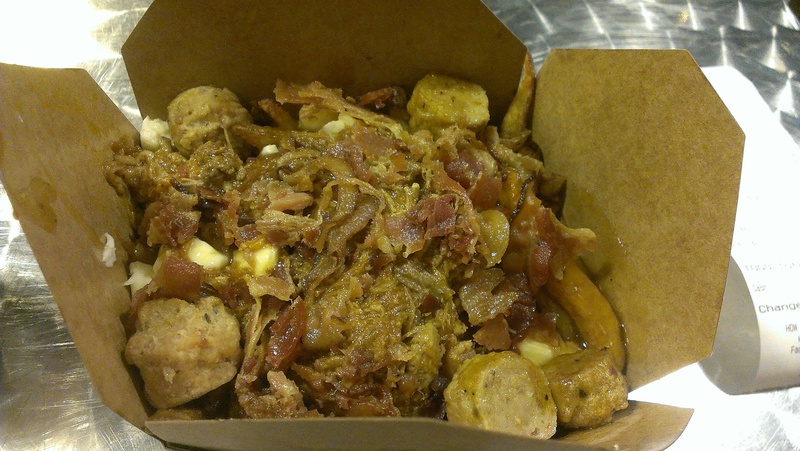 This entry was posted in Fast Food, Food Reviews and tagged bacon, poutine, pulled pork, Smoke's Poutinerie. Pig on the Street: Bacon All the Way! I was wandering around downtown yet again and I had my eye on food trucks again. I just have so many on my list to try! Since they’re all around the same price, I decided to go for Pig on the Street (love the name). Bacon makes everything taste good right? 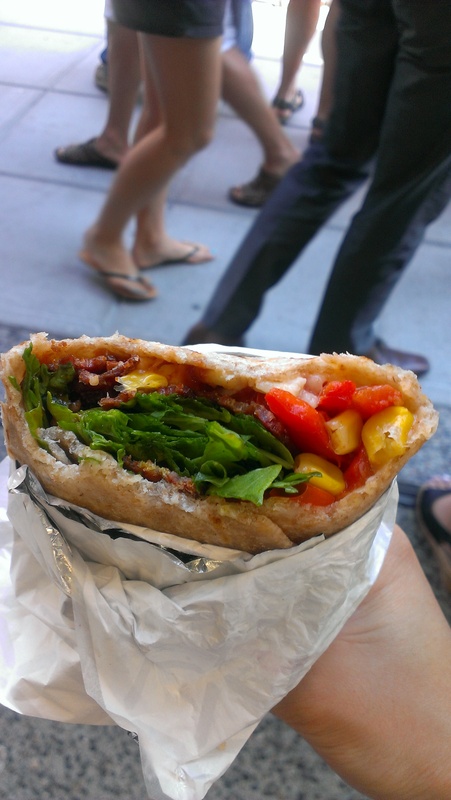 They had a selection of four handcrafted flatbread wraps with bacon and one veggie option as well. While all the options looked equally delicious, I settled for the Southern Piggy. I love how cute the names are! After you place your order, you get to choose a pink wooden pig with funny famous pig names on it and that’s the name they call when your order is ready. I had the Hogfather. This wrap was heftier in size than I imagined! The double smoked bacon was crispy and smoky and everything bacon should be. The bacon was balanced out by the roasted corn, peppers and greens. The bourbon BBQ sauce and chipotle mayo made it a bit spicy but I found that the cheddar was lost in the wrap. They were not stingy with the bacon since there was at least three pieces yet they gave you ample amounts of veggies to make it “healthier” too. The wrap was interesting because had a more doughy feel to it but wasn’t too thick either. 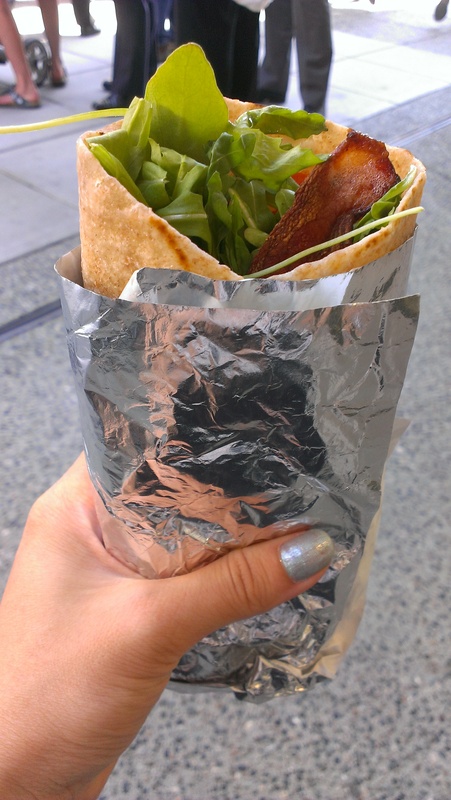 The whole wrap was packed with flavour and I loved every bite of it. It didn’t feel greasy either even though there was a lot of bacon. Super delicious and satisfying! Oink! 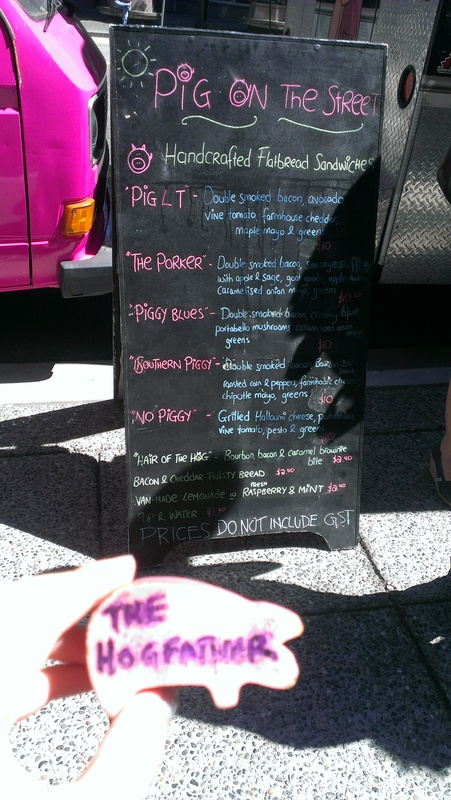 Pig on the Street is about to be named my favourite food truck! Okay I really haven’t tried that many yet but I’m making my way through my list! I would probably choose this over Mom’s Grilled Cheese but it’s not really fair to compare. I like that they try to be vegetarian friendly too but I doubt many vegetarians would stop by a business that specializes in bacon? This entry was posted in American/Burgers, Fast Food, Food Reviews and tagged bacon, food trucks, Pig on the Street, wraps. 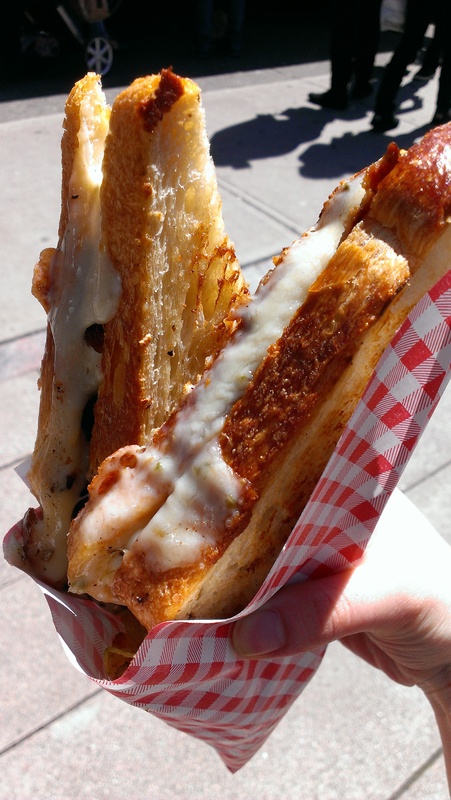 Vancouver is turning into a food truck hot spot and Mom’s Grilled Cheese is a pretty popular option. 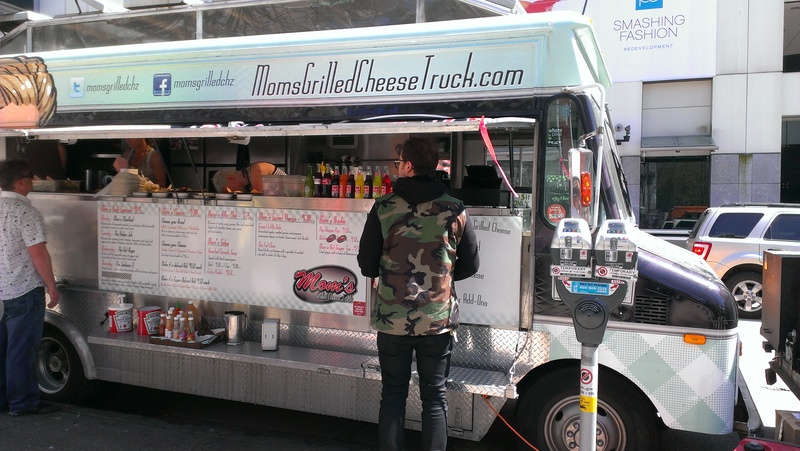 Located by the Art Gallery on the corner of Howe and Robson, you can usually find Mom’s Grilled Cheese and its long line-up 7 days a week. Long line-ups must mean good food right? I was about to find out! I had always secretly wanted to try it out but the timing was never right and they seemed pricey for something so simple. I mean I can make my own grilled cheese sandwiches at home! Basically you get to choose your bread, your cheese and any add-ons that you want such as sliced red onions or tomatoes and of course there are deluxe add-ons like bacon! =D There are also daily specials but I went on a Friday and they don’t seem to have a Friday special anymore. 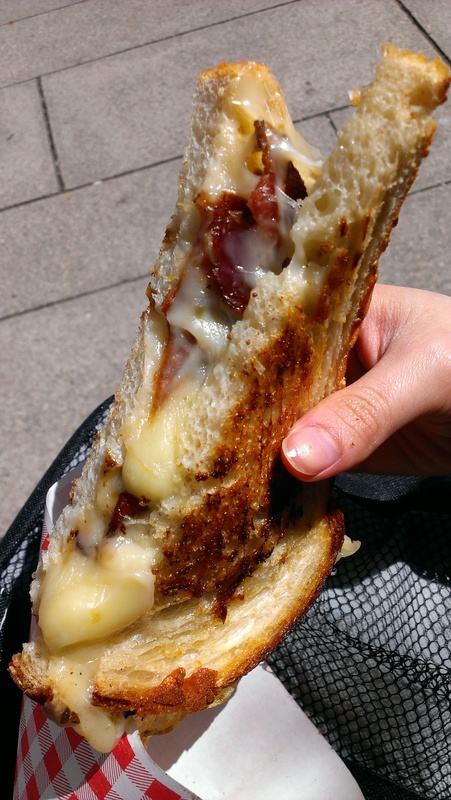 I got sourdough bread with pepperjack cheese and bacon ($1.50). Mmm look at all that ooey-gooey cheese on that glorious sandwich! All sandwiches are served in a paper cone with a slice of pickle and Hardbite chips (they were on Dragon’s Den!). Close up with the bacon! The sourdough bread was well buttered and crispy while the bacon made the sandwich salty. They did not skimp on the cheese at all and it was well melted throughout the sandwich. In fact, I almost felt like I overdosed on cheese after and I was super full afterwards. I don’t think I could really taste the pepper in the pepperjack but what do I know about cheese anyway? These grilled cheese sandwiches are a lot fancier than what I can make at home and they really hit the spot if you’re looking for some gourmet comfort food! I can see why this food truck is so popular! I didn’t take a picture of the chips but they reminded me of Ms. Vickie’s chips but in the original flavour because they had a similar texture. ‘Mom’ Cindy is super friendly and they seem to have a lot of regulars too. You can also ask for a box instead if you plan on eating your sandwich later or even extra pickles. 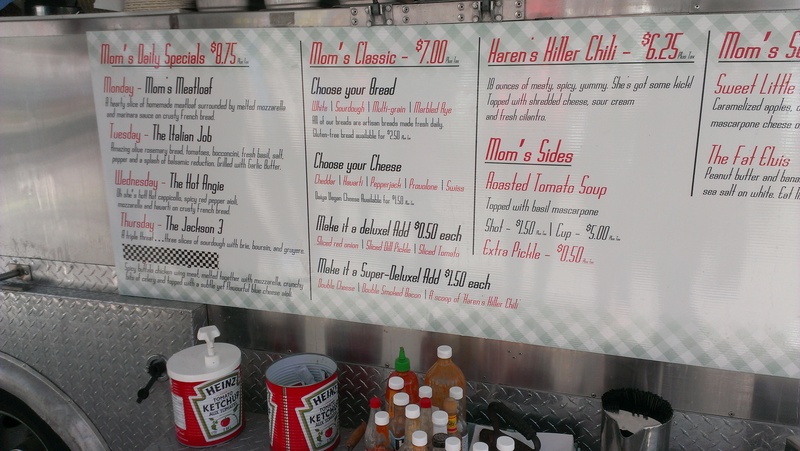 If you’re willing to brave the line-ups for a gourmet grilled cheese sandwich, be sure to visit Mom’s Grilled Cheese! This entry was posted in American/Burgers, Food Reviews and tagged bacon, comfort food, food truck, grilled cheese, Mom's Grilled Cheese.